With our October 2018 Update, we’ve introduced a suite of enhancements to NCM Desktop in Beta 3. Dependency chains have been a feature of N|Solid since 3.0, and are a vital part of the vulnerability triage story. With this release, dependency chains are now an integral part of the NCM issue triage story as well. 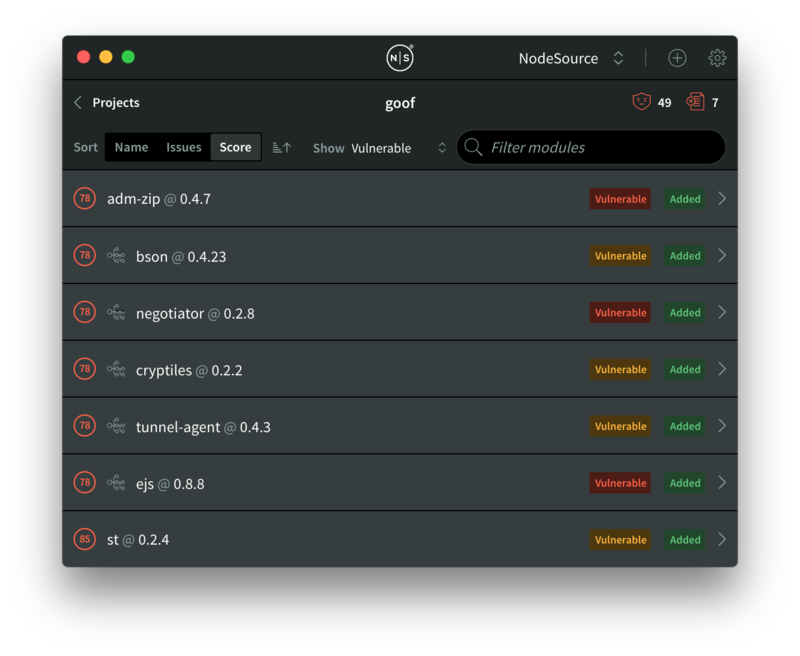 Optional: Goof from Snyk as an example insecure application to triage security issues – feel free to use it as well, or follow along using your own application! 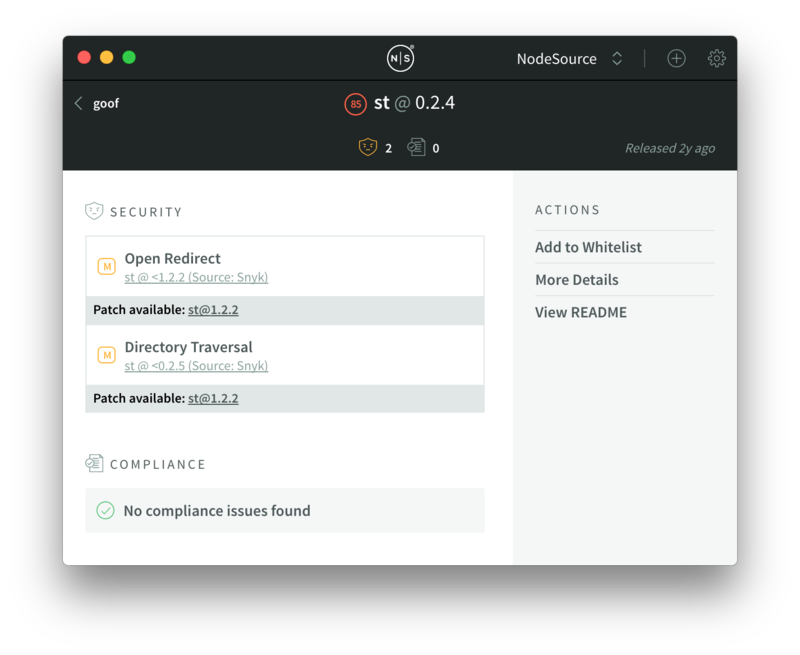 Previously, NCM Desktop surfaced security and compliance issues in the dependencies your applications included… but you weren’t easily able to tell if those dependencies were a top-level dependency or nested somewhere within the tree. 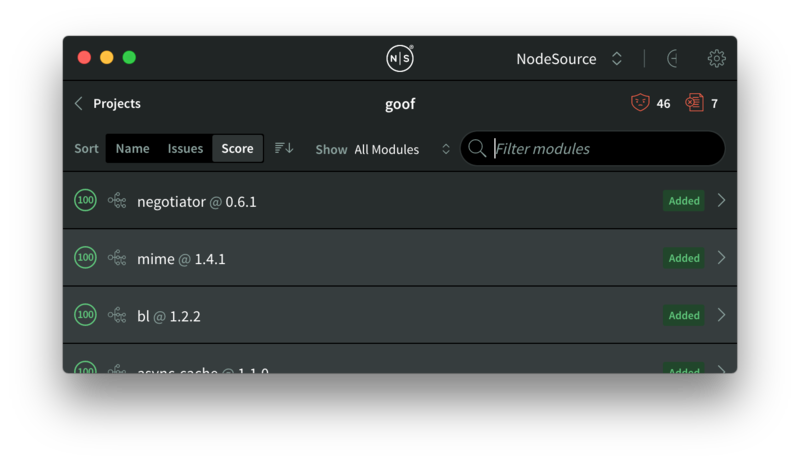 You’ll notice that all modules have a tree icon in front of them except for adm-zip@0.4.7 and st@0.2.4. Each module with a tree icon is a nested dependency that was introduced by a top-level module, somewhere in their tree. Because both adm-zip@0.4.7 and st@0.2.4 lack the tree icon, we can easily tell that they’re introduced at the top level of our application. 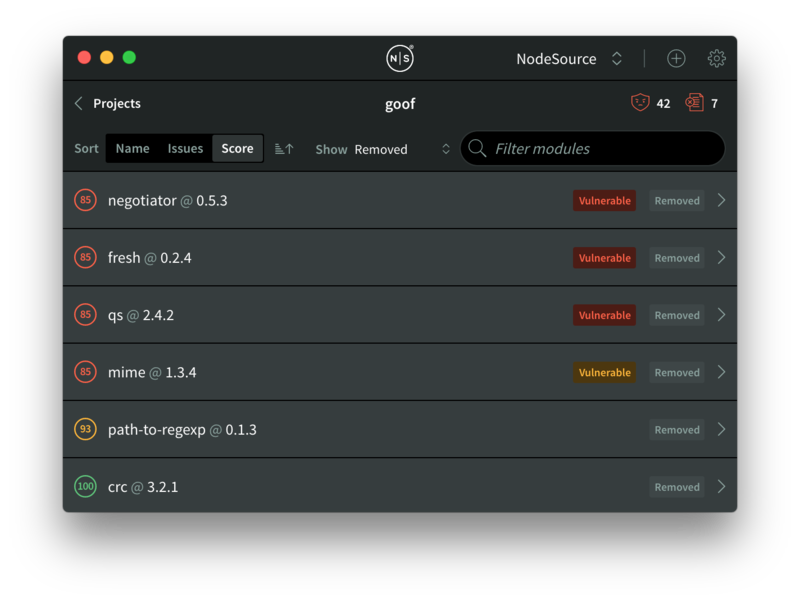 This will ideally help you quickly identify which modules can be quickly resolved and which ones may take a bit more work. Since there are two direct issues being introduced by st@0.2.4, we’ll try resolving some of them by updating that module! It turns out st@0.2.4 is actually introducing two medium vulnerabilities by itself, not counting its dependency tree. You’ll notice that there’s a "Patch available" section beneath each of those vulnerabilities. The version that is mentioned in both – st@1.2.2 – is the version that has the specific vulnerabilities resolved. In this case, it’s easy since st@1.2.2 is the patched version for both. 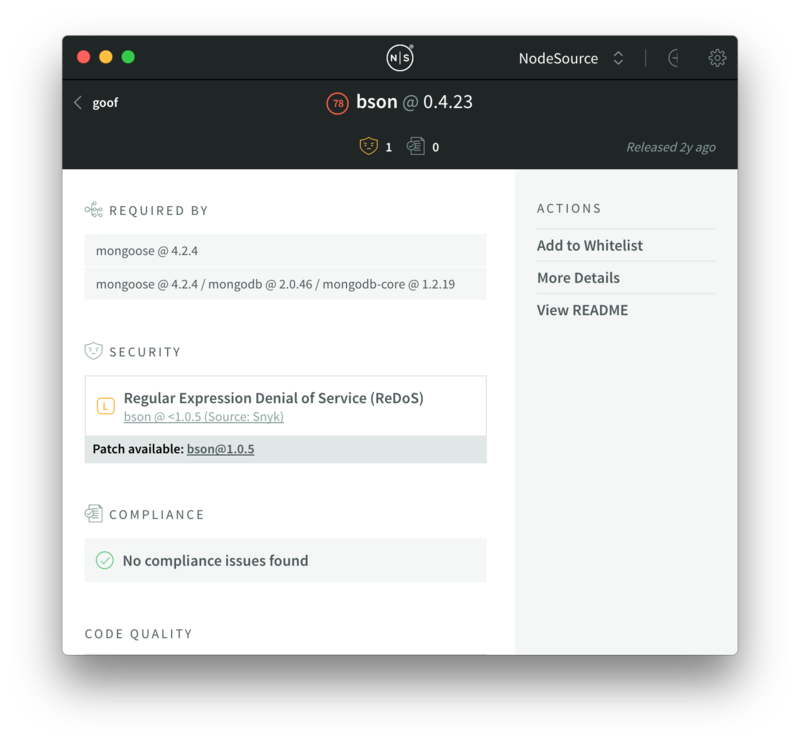 After updating the project’s package.json, ensuring our code is compatible with the updated module (and making any needed changes), and npm installing, we should be rid of a few vulnerabilities. If we want to dig in a bit more to what actually changed when we upgraded to st@1.2.2, we can look at the "Added" and “Removed” filters, we’ll see exactly what changed. 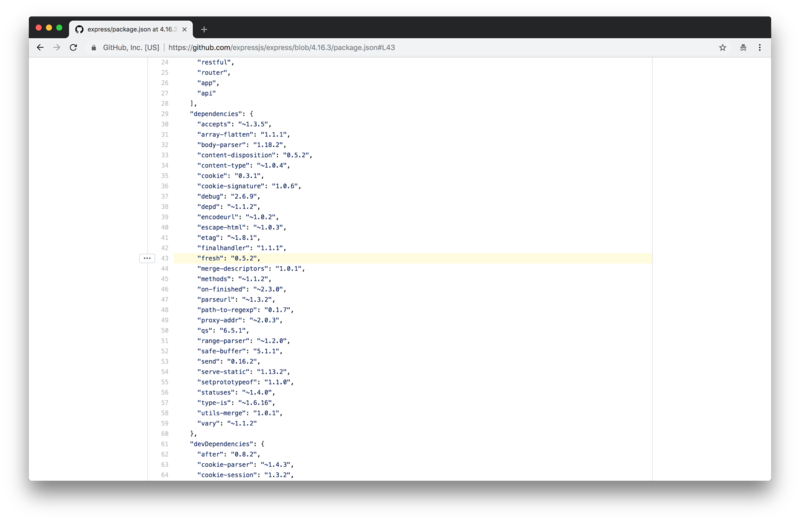 The "Added" and “Removed” filters are extremely handy for understanding your applications’ health and security as you’re working on them, showing you a play-by-play of what’s being added and removed as it evolves in real time. 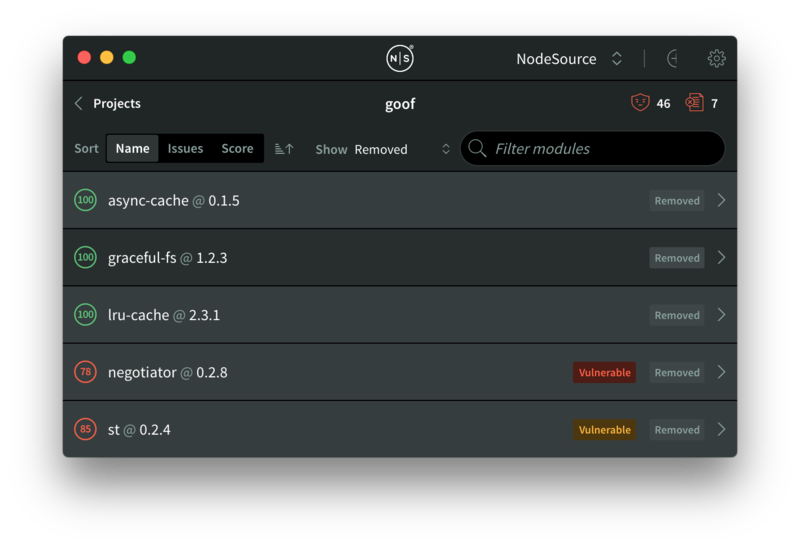 We’ve just improved the overall reliability and safety of our application with a relatively simple change in our dependencies. Yay for simple and impactful changes! We’ve already resolved an insecure top-level dependency, and coincidentally resolved a nested dependency. What about nested dependencies whose top-level module is itself secure? I personally know that Express has been actively maintained and developed over the past two years, and that there are definitely more modern releases that have shipped since then – I’m not at all surprised that a two year old version introduces vulnerabilities. To investigate, we could just npm install express@latest and see if that resolves the issue… but that defeats some of the fun. 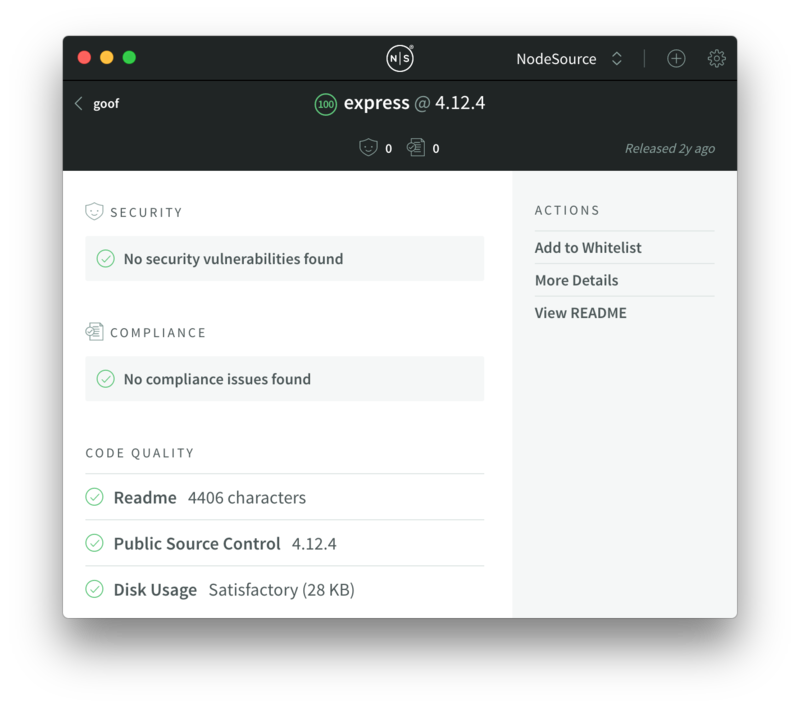 Let’s open up the repo by using npm repo express, and then head over to the latest v4.x.x release. 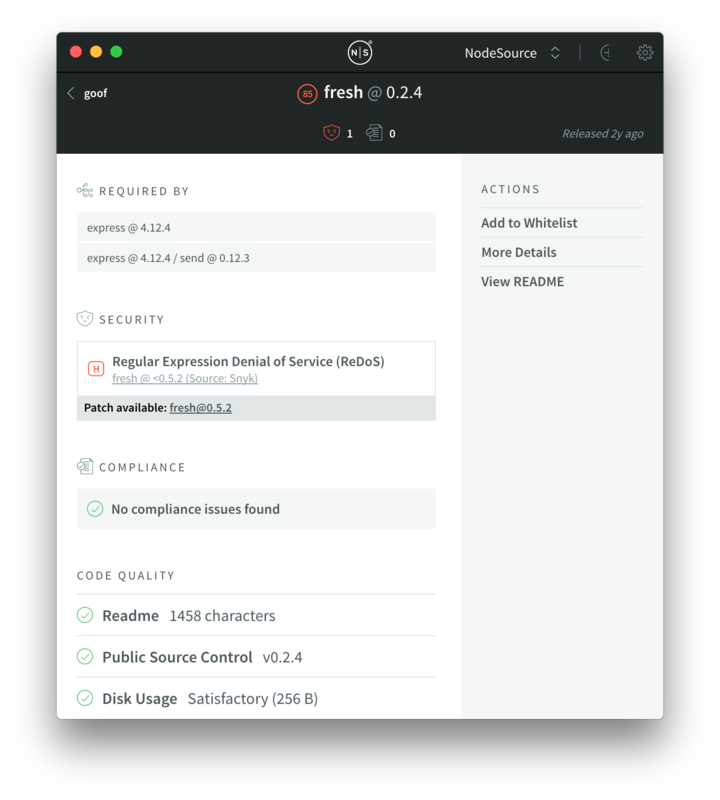 On line 43, we see that the fresh module is up to date at fresh@0.5.2 – the version mentioned in NCM Desktop as the safe version! Yay! 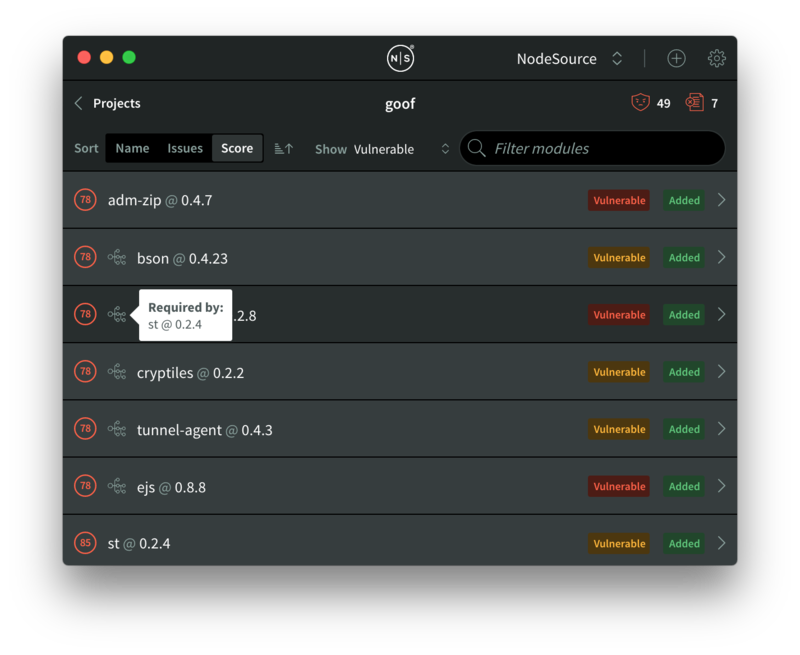 We erased four more vulnerabilities with a simple upgrade, thanks to about ~5 minutes of work and the new dependency chains feature in NCM Desktop Beta 3. General Advice: What Else Can You Be Doing? In building out this release, we noticed that this was a relatively common issue – an old and vulnerable/unpatched dependency introduced a suite of other security and compliance issues. 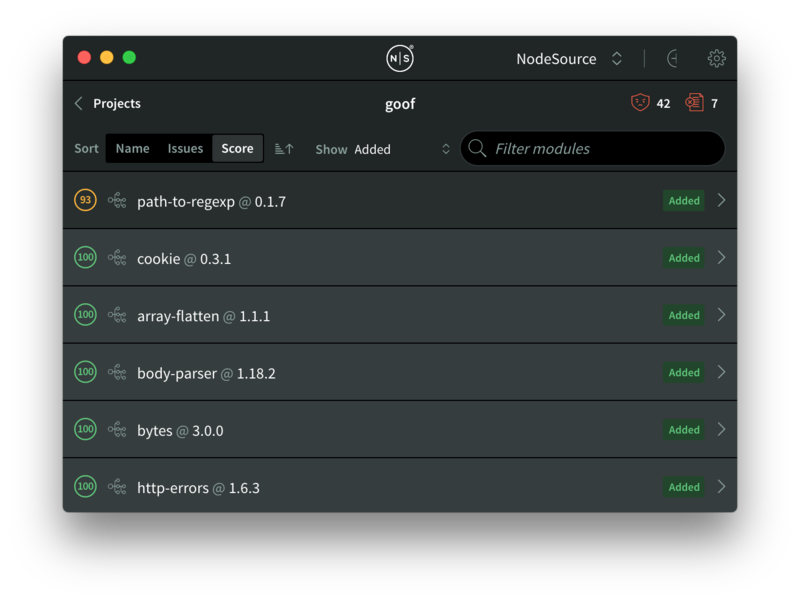 Using automated tools like Greenkeeper can help ease this pain by consistently keeping your dependencies up to date via GitHub, eliminating a lot of the stale and old dependencies that can slip your attention over time. Additionally, when working on publishing your code using something like Semantic Release with the @semantic-release/git plugin will help smooth out several common best practices and NCM Desktop criteria, including one of the most commonly missed: git tagging. Use a single linter for your entire team. We use Standard at NodeSource, but using a common linter across all of your projects will save you an immense amount of time and help you ship solid software that has a smaller surface area for security issues to surface.